I hope you find some useful information on my site. You can start searching by clicking on surnames or names in the menu at the base of the page. This site seeks to promote the exchange of information amongst those who share a common Australian heritage. Much of the information on this site is the product of collaboration since my interest in family history started in 1988. The fact that some of the information has been supplied by family members or contributors offers considerable benefits to researchers but it also means that it is difficult to validate some of the information. If you have more accurate information, wish to correct any entries or have additional information, please contact me. There is always some sensitivity in publishing family history information and I hope none of this information will cause offence. The names of the living are not knowingly published. If I have erred in the status of a relative please met me know. 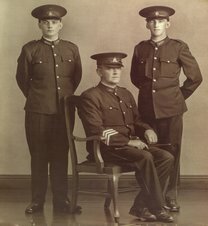 Constables Kevin and Jim McMahon with their father, Sergeant Peter McMahon, in 1937. The constables’ great Uncle, Patsy Daley, rode with Ben Hall and this photo was taken in 1872 when released from Pentridge.